Where Are You, Puffling? and Where Did You Come From? This week we chatted with the wonderful Gerry Daly, co-creator and illustrator of Where Are You, Puffling?. Gerry’s uncle Sean came up with the initial idea, and the story developed from there! Gerry tells us all about the journey of this adorable picture book, including working with the brilliant Erika McGann. What inspired your uncle Sean to write this story to begin with? When Sean was visiting the Skellig islands he noticed that the puffins and the rabbits seemed to be getting along together as they went about their business. He heard they even share their burrows! Or at least the rabbits move back in once the puffins head out to the ocean for the winter. Sean imagined they might help each other out in times of need, and he thought this could make a good story for his grandsons. What was it like to work with Sean on this? Unfortunately, around this time Sean had been diagnosed with cancer, and he passed away not long after. I was then back at college doing a masters, and didn’t have much time to look at the book for a while, but eventually I managed to add the illustrations. I didn’t have a title to the story, so my dad suggested ‘The Skellig Shenanigans’. I had a few printed up, which came as a nice surprise to family and friends, most of whom had no idea that this had been in the making. I didn’t want the story to just be forgotten, and felt it really had to be finished best I could manage. Tatyana Feeney, author and illustrator of the wonderful picture book Socks for Mr Wolf, shares her story about where this quirky character came from and shows us the awesomeness of socks! My stories usually start with a character. I like to draw the character and think about a story that might develop around them. I had been drawing a wolf character for a while; he actually started life when I was a student at art college, and I was always hoping that he would have a story, but there was never one that seemed exactly right. I liked the idea of the wolf being a friendly character, rather than the typical ‘big, bad wolf’, but I wasn’t able to think of something that seemed like a great, original story for him. 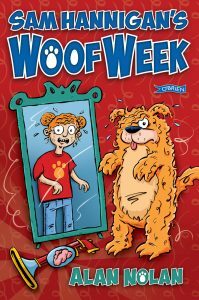 Author and illustrator Alan Nolan chats about writing, illustrating and the inspiration for Sam Hannigan’s Woof Week! Sam Hannigan began life in one of my battered sketchbooks as a sketch of a young girl with freckles, playing an oversized guitar and wearing a cowboy hat. As with most of my characters, she came into my head in the middle of the night, cowboy hat and all, and I scrambled at the side of my bed for a sketchpad and a pencil to get her down on paper before she pulled up the bedroom window blind and escaped. As usual, to avoid waking my wife, this was drawn almost completely in the dark – when I woke up in the morning I had to make sense of the manic, spidery scribble, which I’d jammed into my shoe so I’d remember I’d done it in the first place. 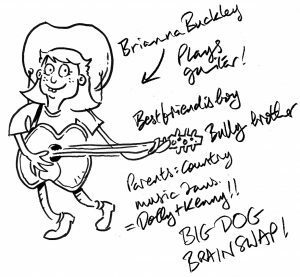 Beside the sketch I had written ‘Brianna Buckley, plays guitar, eats dog biscuits, best friend is a boy, bully brother, parents country music fans = Dolly and Kenny, big dog, brain swap’. Matt Griffin, author of The Ayla Trilogy, chats about his experience of writing a trilogy: the inspiration, the method and his three central thoughts! Ayla’s adventure was always envisioned as a trilogy. The sacrosanct Three Acts; beginning, middle and end; the ‘monomyth’ of the hero’s journey. Three books in which to take a character from normality to abnormality and back again, nicely tied off at the end, with everything as it should be. I’m going to start with my hero already in trouble. 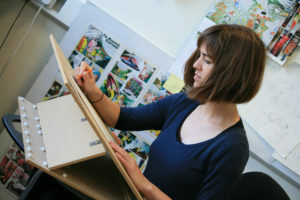 Shona Shirley MacDonald chats to us about her experience of illustrating this beautiful book. Emma Byrne, who designed the book, describes the commissioning process and the importance of illustration for a book like this. When I first heard about the project I was instantly keen to get started and already imagining how the finished book might look. Near the beginning I was lent a biography of W.B. Yeats and ended up reading it all in one sitting, which I think was quite useful and must have helped to inform the way I interpreted his poems. The introduction and background about Yeats as a child by Noreen Doody also added to that. Apart from learning a bit about his life, however, I didn’t search for any analyses of his text (with the exception of ‘Running to Paradise’), so for the most part I just illustrated it the way it made sense to me, taking into consideration that the anthology is aimed at children. I was already familiar with some of the poems, including ‘He Wishes for the Cloths of Heaven’, but I hadn’t realised they were written by Yeats. Mostly the poems and stories were new to me, but they were not hugely difficult to conjure images for, as they are already rich in imagery. Each illustration had its own meandering and tricky journey, though. The most difficult poem to illustrate was ‘Running to Paradise’, it seemed quite obscure, and it took me some time to fully get to grips with it. 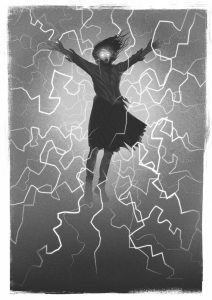 Also I was initially worried about what to do with ‘The Man in His Boots’, but then I realised it was set in a haunted house, and if I couldn’t make that look interesting then I shouldn’t be an illustrator. 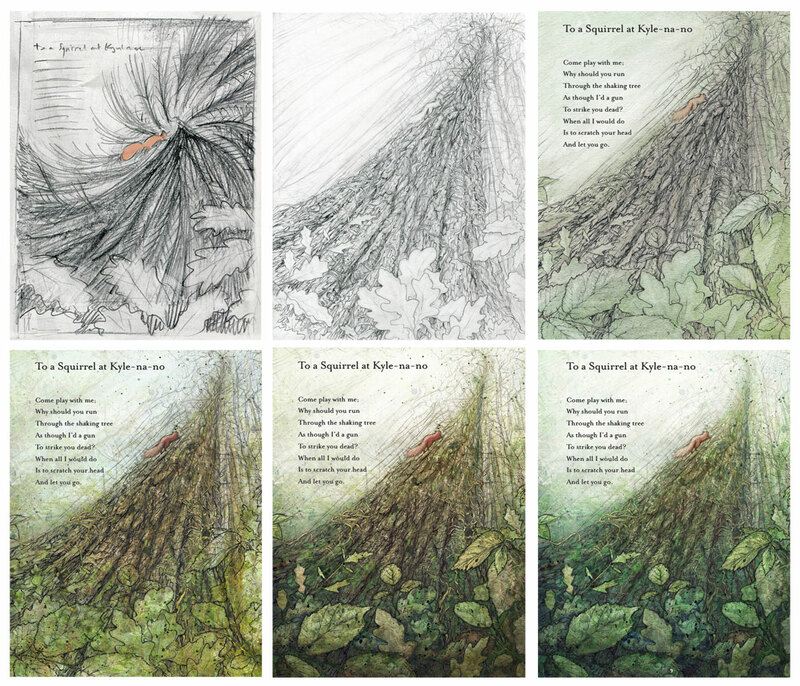 Perhaps my favourite illustrations in the book are the ones I did for ‘The Wisdom of the King’, as they were some of the last ones I illustrated, and it was nice at that point to create a series that belonged together rather than individual images, as for many of the poems. 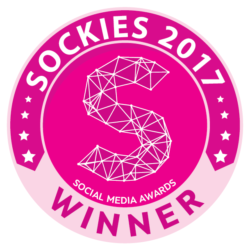 With all the detail that went into each illustration it was certainly a time-consuming project to work on, but it was enjoyable. However you always need another set of eyes. Emma, the designer, was great at guiding the project, allowing me space to interpret the poems, but also giving feedback and constructive criticism. My partner Ciarán who is also an artist was another huge help throughout the project. There is still much I have to read of Yeats’s poetry, but working on this book has brought me an appreciation of his work. It was brilliant to have the chance to create strange and magical images for such beautiful poetry, and my hope is that children and adults alike will get enjoyment out of reading the book too. As a fan of the work of our national poet, I was hugely excited when this book came across my desk. 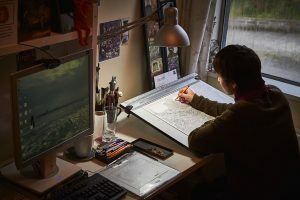 I also knew it would be an enormous challenge to find an illustrator who could interpret, embellish and visualise the work yet enhance it – without overpowering it. 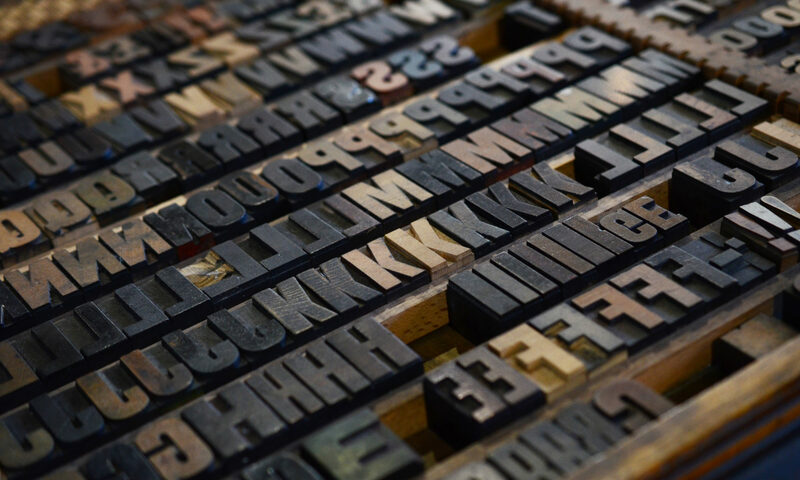 This takes discipline and sensitivity – where both the text and visuals combined take the reader on a road, a journey the reader needs to finish themselves. The physical book was important to Yeats, and it seemed fitting to convey that in this exploration of his work for children . The packaging, which included the flaps, a secret poster, and different laminate cover all enhanced this, but the lynchpin, was always going to be the illustration. I hadn’t worked with Shona before, but had asked her to do a sample for another project. It wasn’t right for that particular book, but I saw a magic in it, and kept her work in mind. I saw her work online, and saw these imagined worlds full of strange creatures at play and thought, this is perfect! I asked her to do a fully worked sample for ‘The Lake Isle of Innisfree,’ to see if she could do the whole project. I told her to lose all inhibitions and immerse herself in the work – and interpret freely. I told her a little of the world of Yeats and some of his obsessions with fairies and the magic in nature, but really it was just all in the text. When the resulting sample came in, to say I was blown away was putting it mildly. I knew it was going to be very special. The initial concept, which starts as the poet is standing ‘… on the roadway, or on the pavements grey,’ and the explosion of life and colour that works its way up the page, was in itself very strong. But it’s exceptional beauty came in the detail that revealed itself in creatures and unfolding colour as the poem progressed. All of this whilst creating an atmosphere and visual tension. This artwork, like the poem, would reward by revisiting again and again. I showed it to the inhouse team, and they all agreed, this was the illustrator for the project. Also the author, Noreen Doody, was suitably impressed. So we set out a schedule and all got to work. Each illustration had a series of rough approaches before we went to colour – so hugely time consuming. Each poem brought a different interpretation, and a different approach in concept and visualisation. It is difficult to choose favourites, but if I had to, I think the second illustration for ‘The Wild Swans at Coole’, where the swan becomes the lake is genius, as is the power in the illustration for ‘To A Child Dancing in the Wind’. The cover art, which features characters from the whole book, is also very clever stuff. These illuminations of Shona Shirley MacDonald, would, I have no doubt, have pleased W.B. Yeats very much. The combined work of Noreen Doody and Shona makes for an exceptional book that will bring young and old great enjoyment – for years to come. The Moon Spun Round is available here and in all good bookshops! 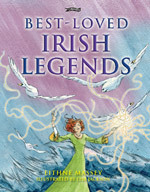 We are just putting the finishing touches to our exciting new Best-Loved Irish Legends with some fantastic illustration by Lisa Jackson. Lisa has done a great job and really enlivened these great time honoured stories freshly interpreted by Eithne Massey. The process started with the text which I put into layout, wrote a brief and then sent to Lisa. 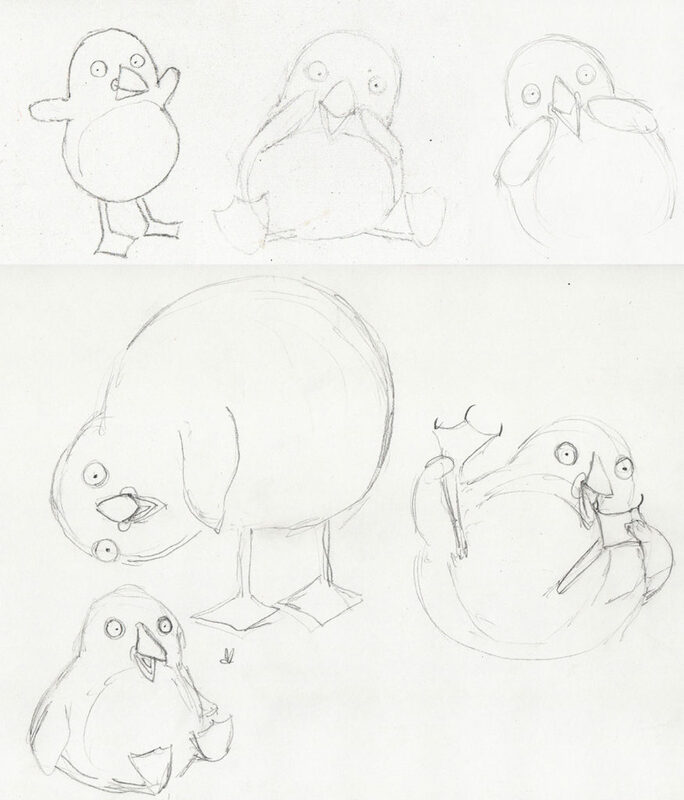 She then gave us roughs for the whole book such as those below.